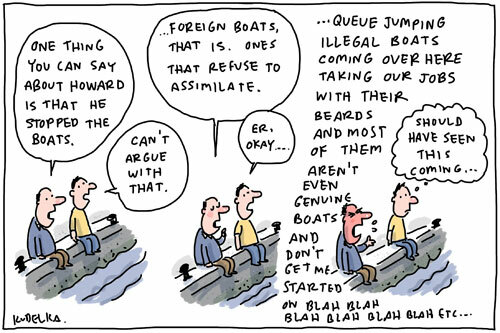 If stopping the boats wasn’t code for punishing desperate people ostensibly for their own good, I’m sure there’d be less argument in this country about how to deal with asylum seekers. Acting like arseholes in order to deter people from attempting to bootstrap themselves out of miserable circumstances is not a solution, Pacific or otherwise. Sure, boats are dangerous. So is locking people up for indefinite periods, so is sending refugees back where they came from, so is living in limbo as a non-citizen in Indonesia, so is rotting in a refugee camp for years on end. There are no easy answers, but if you’re looking for an applicable Australian Value, then “Two Wrongs Don’t Make A Right” wouldn’t be a bad start. I saw this cartoon in the Mercury and googled you. You really are a sanctimonious twit. Do you truely believe that tripe you just wrote? Hey Keren, you’d be the guy sitting on the left. By the way, we spell it “truly” in Australia. I suppose you have to expect some responses like this? Belay that! I read the blog! Watch it Jon, somone’s being funnier than you on yer own flippin’ blog! Everyone’s a comedian these days. Sometimes deliberately, sometimes not.